Depending on where you live and what you do your definition of “EDC knife” could vary greatly. EDC to someone working in an office and someone working on a ranch are likely to be very different. I don’t have a hard and fast rule when defining an EDC knife, but if I had to assign some numbers they tend to have a blade length of 3.5″ or under and a weight of 3.5 ounces and under. Again, that is just a ballpark, many of the knives in this section do not adhere to those guidelines. My advice is to carry what you like, and to not get bogged down with arbitrary lengths and weights. If you are interested in my most highly recommended EDC knives you can find them here. If you want to skip the list of reviews below and read about what I personally look for in a good EDC knife then click here to check that out. Over the years I have found out what I like in an EDC blade, and I will attempt to discuss that for those wanting a little more guidance in selecting their own EDC knife. Naturally, there are a lot of EDC knives to choose from and it’s largely a decision made on personal preference. What is about to follow here is just my opinion so please keep that in mind. I have found that I really like carrying a smaller knife for EDC. I have several reasons for this. First, I like something lightweight that doesn’t take up much room in my pockets. I simply prefer a more minimalist style of EDC and have a slimmed down wallet, key chain and flashlight so it only makes sense that I reach for a slimmed down knife as well. 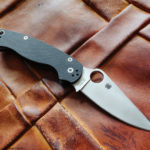 This isn’t always the case, and it depends on what I’m doing that day, but for my “urban carry” I find a knife like the Spyderco Dragonfly works just fine. Some might think I am “undergunned” with this knife but I find it’s got plenty of performance for common tasks and doesn’t alarm the public. I may pair this with a larger tactical knife or I might go with something slightly larger with say a 3″ blade – like a Spyderco Sage or something along those lines. Believe it or not, the blade steel isn’t a huge factor for me. Don’t get me wrong, it needs to have a decent steel but I find that I’m pretty particular about sharpening and maintenance so if it starts to lose it’s edge I give the knife a touch up. VG10, 154CM, heck even 8Cr13MoV works fine for me when it comes to my EDC blade. Corrosion resistance may be a property people look for in their EDC knife steel – and if you use your knife for a lot of dirty jobs or food prep, I might be inclined to agree. That said I think most modern steels offer plenty of corrosion resistance – it’s gonna come down to where you live and what you do. Handle material doesn’t always play a huge role for me either. I like a quality material but I especially appreciate a handle design that is lightweight, strong and offers decent grip. This could be anything from FRN (reinforced plastic) to Carbon Fiber over stainless steel liners. Good ergonomics is one thing I find absolutely essential in my EDC knife. These blades get a lot of use so it must work well in my hand. It’s gotta be big enough to provide a comfortable grip and I prefer features like thumb ramps and choils for added control. The pocket clip is another crucial factor to a good EDC knife. I like tip up carry, and I like a nice discrete carry. The clip needs to be sturdy, have good retention and not stand out so much. I like a nice blackened clip or a small wire clip. For me the clip doesn’t have to be an ultra deep carry clip, but it should ride fairly low in the pocket. A good deployment system is very important if the knife is going with me every day. Thumb studs or a thumb hole are my preferred methods – but a good flipper works too. The important thing is that the knife opens easily and consistently without a lot of concentration. Lockup isn’t super important in an EDC knife. Obviously it needs to be decently secure with little to no blade play, but I don’t require my EDC blade to lock up like Fort Knox. I tend to gravitate towards lockbacks, liner locks and axis lock knives for EDC but really anything could work here – as long as its strong enough for regular tasks and is easy enough to disengage. These were just some general guidelines for you to consider based on my own experiences. Really you are going to want to try out a few different knives to see what you really like – and as you do that your tastes will change. For me a nice discrete knife that doesn’t weigh me down or scare the public is what I like. Then again I often find myself in an urban environment. If you work on a ranch or need a strong utility knife then my idea of EDC and yours will be very different. The important thing is find something that works and to carry what you like. for me, an EDC knife is all you described., emphasis for me should be on one hand, ,thumb hole opening. ergonomics, as you call it, is also important. i have to like the way the knife fits in my hand or the whole thing is sort of an exercise in futility!blade shape is also an important consideration for me, tho not so much quite so. Thank you Mike! I agree, ergonomics (well, how it fits in your hand) is critical – otherwise it just doesn’t get used. Thanks for stopping by my friend. Take care. I purchased a couple of the original Cardsharp some time ago. One to leave in the box and the other to actually use. I have to say that the original incarnation of this knife was as sharp as the devil right out of the box. I did the paper test the same as you did in this review and it took nearly no effort. I was quite impressed, actually. I received my order for the Cardsharp 2 in the mail today with high expectations. I’ll put it mildly by saying it was not the highlight of my day. The condition of the blade was exactly as yours. I’m actually surprised they even sent it to you and requested you review it. I would be embarrassed. The only improvement to the design is the locking mechanism. The first one only had a minor lip which the blade tucked under to keep it in place. Maybe quality suffered on this model because they wanted to meet demand faster this time. Their first model was hard to get your hands on unless you were willing to wait a month or so. But at least that one was worth it. As a backup blade, this thing is great (if it’s as sharp as the first one). Anyone expecting more and bashing it for not being so may as well go and give a Prius a bad review for not keeping up with a Lamborghini. Thanks for the insight, it’s great to have someone here that owns both the first and second generation of this knife. I do not know what exactly was going on with the edge – I thought maybe I got one of the earlier versions of the CS 2, and maybe they were still working out the kinks. To be honest, it’s not a huge deal for me since I was able to put an edge on it without much effort, but it’s a pretty large detail to overlook for a knife. That said, I think you summed it up well – this is a backup blade at best, and you really shouldn’t expect full size knife performance out of it. It’s also a cool design for people who appreciate that sort of thing. Great reviews. Serious carriers dont just grab anything pointy off the shelf when looking for their next edc. Your info on such a wide range of blades is exactly what we look for. Thank you. Thanks for the kind words. We take our EDC knives seriously here, and I am glad you are enjoying the site.